If you already rely on ridesharing services to run errands or grab groceries, a self-driving car that shuttles you to pick up your pre-bagged tailgate party snacks may sound like a no-brainer. 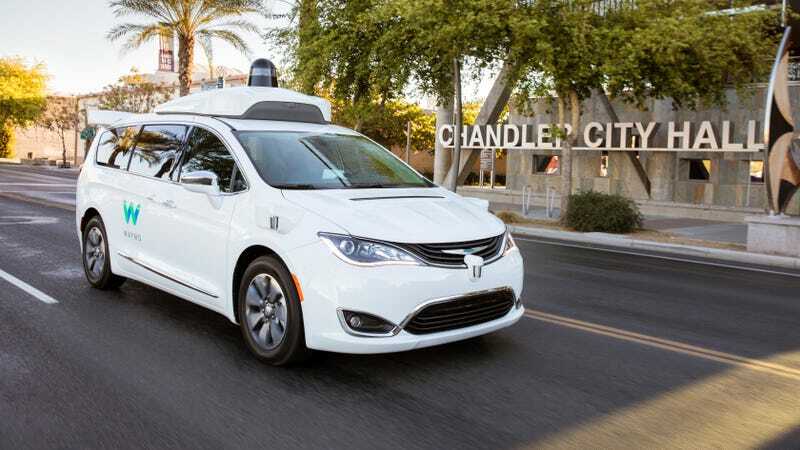 And that’s essentially what Waymo is up to: In Phoenix, Arizona, Waymo is expanding its self-driving car program by targeting the customers of Walmart, the Element Hotel, and Avis. Newly announced deals with those companies could help Waymo prove its cars are more than just a Silicon Valley pipe dream. Waymo says these partnerships were inspired by how its current passengers (“over 400" of them) already use the service. “We’ve tailored our partnerships to meet the top rider needs; in fact, the partnerships below represent eight of the top ten activities our riders do when they get in a Waymo,” the company wrote. Apparently, Waymo riders have been taking tons of trips to Walmart. The deal with Walmart means the few people who have access to Waymo’s service today will receive “savings on groceries each week when they are ordered on Walmart.com.” But to get the discount, you’d have to pick up your packed grocery order from the retail outlet, and let the self-driving minivan chauffeur you there and back. Waymo is also working with Element Hotel to provide “select guests” with self-driving automobile service, and Avis Budget Group, to offer self-driving car services for Avis customers at two Phoenix locations, enabling them to request a self-driving car to assist with picking up or dropping off rental cars. “While these are Metro Phoenix-specific partnerships today, these businesses are national and what we learn from these programs will give us a network of partners when we launch in new cities down the road,” Waymo said, giving optimists hope that the company will one day further expand the program in a meaningful way. Waymo spun out of Google in 2016. It seemed like the excitement behind self-driving cars was fading, after Uber’s fatal self-driving car incident led Arizona to halt Uber’s program in the state. But apparently people still want to take a ride in a computer-controlled automobile, enough so that Uber announced it would restart its self-driving car program in Pittsburgh after temporarily halting it.